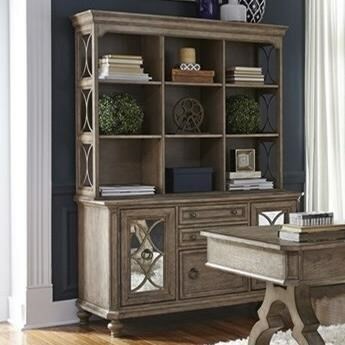 This credenza and hutch brings cottage style with a touch of relaxed vintage appeal to your home office. Its elegant features such as antiqued mirrored doors, canted corners, and decorative fretwork help to create its sophisticated country look. Additionally, with three drawers, two storage doors, and open shelving, this piece provides you with plenty of options to keep your life organized. The Simply Elegant Cottage Credenza and Hutch with Open Shelving by Vendor 5349 at Becker Furniture World in the Twin Cities, Minneapolis, St. Paul, Minnesota area. Product availability may vary. Contact us for the most current availability on this product. 412-HO131 Credenza Hutch 1 56" 14" 45"
412-HO120 Credenza 1 56" 22" 31"
Let this collection's elegant cottage style infuse your home with a relaxed look that will never go out of style. Constructed from rubberwood solids and oak veneers, these pieces are durable and able to withstand the wear and tear of your modern life. Features such as bun feet, fretwork accents, and subtle bead molding add additional touches of elegance of this collection. The Simply Elegant collection is a great option if you are looking for Casual Cottage furniture in the Twin Cities, Minneapolis, St. Paul, Minnesota area. 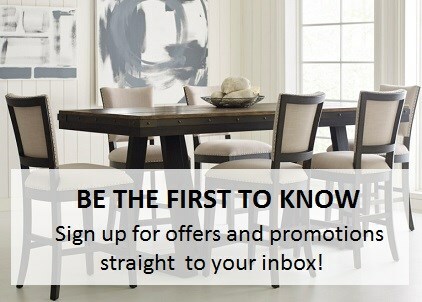 Browse other items in the Simply Elegant collection from Becker Furniture World in the Twin Cities, Minneapolis, St. Paul, Minnesota area.